It’s Halloween! A wonderfully creepy night, full of fun, fright, and, of course, candy! 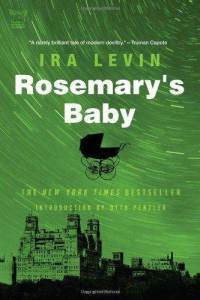 So, to celebrate, I thought I’d review a horror book I read recently...Rosemary’s Baby. Alright, so here’s the backstory. I watched the movie Rosemary’s Baby with my husband a few years ago, and…I hated it. UGH! I wanted to throttle Rosemary the entire movie! I thought she was an idiot, and the whole thing just had my teeth on edge. But after the movie was over…I kept thinking about it. I couldn’t stop thinking about it. A week or two later, I watched it again, by myself, thinking I would turn it off after ten or so minutes. Nope! I watched the entire thing, and saw that Rosemary was not so stupid as I had believed. I didn’t love it, but I realized I didn’t hate it, either. Since then, I have grown to love that movie. I’m not entirely sure why. I don’t like religious horror usually, but this one is so different, without jumps or gore, and yet full of creepiness. Every time I watch it, I grow to like it more and more. So a few months ago I decided to read the book. It took me awhile to get it, but by the time I did I was really excited to finally get into it. And I wasn’t disappointed at all! Okay, so first the story, if you aren’t already familiar with it. Rosemary is a young woman who, with her husband Guy, moves into a new apartment. All Rosemary wants is to have a baby, but Guy keeps pushing it back, saying he wants his career to take off first. But shortly after meeting their neighours, an elderly couple who are nosy but seem to have the best intentions, Guy suddenly gives in and says they should try for a child. Rosemary is ecstatic, and after a very unsettling night of strange nightmares and waking up with scratches and an apologetic husband, she discovers she is pregnant. It’s an odd pregnancy, full of months of terrible pain and drastic weight loss, followed by a sudden stop in the pain, and a happily kicking baby that makes Rosemary’s spirits soar. But near the end of the pregnancy, Rosemary begins to suspect something horrid is going on. Namely, that her neighbours are actually witches, and they are after her baby for their rituals. She is only half right. The neighbours are witches alright, but they don’t want to harm Rosemary’s baby…they want to worship it, because the truth is, the baby is Satan’s. I was absolutely blown away by how well this book matches the movie (or, rather, the movie matches the book). It is pretty much the exact same. Seriously. If you’ve seen the movie, you’ve pretty much read the book. About the only changes are that some scenes are longer in the book…so the movie is like a slightly clipped version of the story. But the scenes, the dialogue, the people (aside from Minnie…she is described differently in the book, but her mannerisms are the same from book to film)…they are all spot on. You might think this would take away from the fun of reading this story, but it didn’t. At all. I loved this book! I had so much fun reading through it, seeing how similar it was. You know when books have a cinematic feel, and you can picture the scene in your head? Well, since the movie is often word for word and movement for movement like the story, this was easy to do…it was like watching the movie at a slightly slower pace. One of my favourite things about this book is the character of Rosemary. I wondered about her when I watched the film, and after reading the book, I wonder more. Is she sweet and stupid? Or clever at using the sweet/stupid appearance to her advantage? Sometimes she seems really daft, and other times extremely insightful. I’ve never been able to pinpoint it, and I kind of love that complexity about her. I enjoy not being able to quite figure her out. I feel like I could talk about this book for ages, but I’ll stop here. The bottom line is, if you liked the movie, and like reading books based on films, I would definitely recommend the book. Or, if you haven’t seen the movie, but want a good creepy read without a bunch of gore and real violence, then I would also suggest it. It is that rare sort of story that is difficult to exactly explain…it is kind of terrifying in its quietness, and that makes for a great read.